This past October 29 marked the one-year anniversary of Superstorm Sandy, the largest Atlantic hurricane on record. 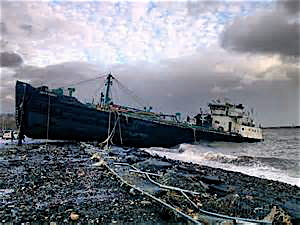 Though only a Category 1 when it came ashore, its winds spanned 1,100 miles and brought with it a 14-foot storm surge that devastated coastal communities in the northeast United States. 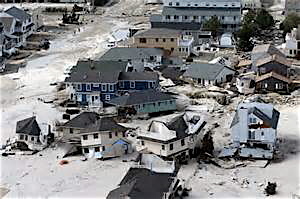 Sandy was the second most costly hurricane in U.S. history, with damages over $68 billion, trailing only Katrina’s $108 billion. And there was the human toll, 286 people killed in seven countries, 72 in the U.S. This massive storm stretched from Maine to Florida, and reached as far inland as Wisconsin, causing heavy rain and snow. 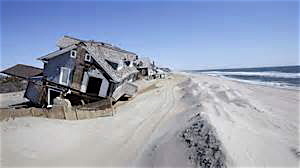 There always is a lot of talk by government officials, politicians and environmentalists after a disaster like Sandy, as they try to decide how to prevent a similar circumstance from occurring again. This thoughtful approach is all well and good, but in the meantime there are families sitting outside their gutted homes with nowhere to sleep. For individuals in these circumstances, there is no moving on from Superstorm Sandy, or a return to normalcy, until they can figure out where to live. Do you rebuild or move away? I lived in New Orleans when Hurricane Katrina came knocking, and once all the water receded, it came down to the insurance companies didn’t want to pay. And trust me, they will find a way not to pay. If you had homeowner’s, then they tell you that you should have known you lived in a flood zone and needed additional insurance. If you had flood insurance, then the damage was caused by wind and rain. They always find an out, and they will take you and your tattered family to court with their sea of lawyers and tell you sorry, we don’t have to pay on this claim. What ends up happening is folks can’t afford to move away. If the insurance companies or other government programs don’t pay out, then no one has the cash to walk away and start new, especially in this economy. They become a hostage to a plot of land. But it is their plot of land. Maybe this is where they grew up. Maybe their whole family grew up in that house or in the neighborhood. There is no other place these Sandy survivors can call home other than where they currently live. Could these disasters be avoided? Absolutely. In every occurrence, generally the worst hit areas are places that never should have been developed in the first place. Greedy developers swoop in to build lower cost, blue-collar neighborhoods, in less safe areas, and for whatever reason the zoning and permit boards allow this. Breezy Point, NJ sounds an awful lot like the Ninth Ward neighborhood in New Orleans. It is full of close-knit families, many who owned their homes, not very affluent, but full of people who work hard to provide for their families and contribute to their cities’ character. Ultimately, officials know they can’t protect these areas, and they shouldn’t have been built upon to start with. Now we have global warming and rising ocean levels. There is little humans can do to prevent an angry ocean from reclaiming that which it desires. So what happens is the insurers and zoning folks team up to put in place new ordinances and flood zones to enhance safety and discourage rebuilding. If insurers say that all these houses have to be hurricane proofed and elevated off the ground in order to even qualify to be insured, then people already struggling with expenses can’t afford to rebuild. It can cost upwards of $150,000 to raise a house on stilts. If you choose not to pay that expense, the premiums on flood insurance are running around $30,000 annually. Even with improvements made, residents with a house sitting four feet below the flood plain could face new yearly insurance rates of $10,000, up from a couple hundred dollars previously. Estimates for rebuilding even modest houses to the new hurricane standards are running over $250,000, which can be double what the insurance companies are willing to pay out. This results in an American phenomenon – get out of the way and I will do it myself. People take matters into their own hands and rebuild. This is how New Orleans got back on its feet, and this is what’s happening in areas hardest hit by Superstorm Sandy. These folks couldn’t afford to rebuild properly, nor could they remotely afford the insurance regardless. It’s a gamble, but the only option they have. These residents are the new pioneers. They are hoping the worst doesn’t happen again, and if it does, they have nothing to protect themselves from becoming homeless. I remember going through the neighborhoods after Katrina. There was that stink from all the dead refrigerators full of rotting food. People hauled soaked drywall out to the street, some rebuilding already, others just getting started. Tears were shed from block to block, as the immensity of the tasks before them would often become overwhelming. A residual culprit became one of the biggest enemies. Mold overtook waterlogged homes, and the same is happening in New Jersey, New York and Connecticut, impacting air quality and crippling those with allergies. Sometimes we need an elected official to step up and say, sorry, but we are not going to rebuild here. It’s too dangerous. That is a big statement to make. There obviously will be major political fallout, and you have to deal with what is done with those that are forcibly displaced by eminent domain. From a society standpoint, we are not there yet. There certainly is not the political will or leadership to take on such a stance in the currently crippled American political system that is being strangled by hyper-partisanship. Americans are a reactionary people. It will take a natural disaster that brings with it a loss of life and property greater than anything we have witnessed previously, before any significant precautionary measures are done to help protect people in coastal communities. I feel for the people suffering in Sandy’s wake. New Orleans is a different place than it was before Aug. 29, 2005. In many ways improved, but different, and not nearly healed. Now we all are witnessing as the Philippines dig out from the aftermath of Typhoon Haiyan. The level of destruction continues to unfold, but 3,637 people are known dead thus far. On this first anniversary of Superstorm Sandy, I wish all who were impacted good luck and continued patience. It will get better. As they say, time heals, and in these sorts of instances that is certainly true; just hold on, and be nice to your neighbors. Help each other out when you can, and get the hell out if the creek starts rising again. 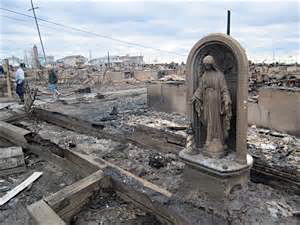 This entry was posted in News, Travel and tagged Breezy Point, Hurricane Katrina, Superstorm Sandy. Bookmark the permalink. Thanks for this post. I guess people who didn’t experience what it was like in New Orleans when the storm hit cant even start to imagine what it was like. Your blog style really brings their plight home, especially with what may likely happen with future storms and how little support they get from the outside. Its a strange world in that people in our own countries can be left ‘hanging out to the cleaners’ by the people that are supposed to be looking out for us IE our governments. To say people in New Orleans have been neglected is the understatement of century.